It's been a very long while. Who even knows if anyone still follows this little blog o' mine. Things have changed quite a bit since the last post. It's been 2 years, to the day, at least as I'm writing this/have re-upped on squarespace. That wasn't planned, but life is funny. Or, at least really weird. Why have I started this up again? Well that's a good question. I bought a fountain pen recently (pictured above, Visconti Homo Sapiens Bronze Age, F nib, bottom shelf from Goulet Pens) thanks to a small windfall, most of it went to boring things like savings or debt consolidation loans, but I decided to go ahead and splurge. I'm also not sure what drove me to do that. To be honest I've moved pretty far away from the life of stationery. I think I bought a single pen in 2017, maybe two? And stopped my field notes, and made the very real decision to stop acquiring notebooks. So far in 2018 I have touched pens even less. It's not a conscious decision for the most part, just life getting in the way. So, what happened? Well, in 2016 and 2017 I was sucked into baking. It was just from my home, and not a full time job, but I worked full time during the week, and 85% of the time I was selling anywhere from 8 to 16 loaves of bread a weekend. It was one of the most satisfying things I've ever done. Full stop. I posted about it some here, but when I started to sell, I ended up with very little time or more importantly energy, except what went into work and then baking all weekend. 2017 also had me getting a new job. Something I wanted to do for a good long while. I had been wanting to shift my attention and time at work and realized my old employer wouldn't allow for it. I heard about an opportunity to work again with an old boss and jumped at it. Got it, thankfully, and about two or three months in decided yes, I'm moving. For real. And in September I picked up and left Oakland. My weird old cat and I moved ourselves to Brooklyn, driving across the entire country with my Dad, staying in Motel 6's the whole way. I'm less than a month shy of being here for a year, and I like it a lot. I moved here to escape, and to figure out where I want to be going. So far work has been all consuming, but even so, I'm pleased to be here. So back to this blog. I think my vague idea is this. Even without using pens much, one of the first things I did in my room was set the shelves in the photo above up, important to display your inks after all. And more and more the last few weeks I've felt a strong urge to ink up pens again and write more. Over the last year I've baked less, and written less, but I started painting again, and I started doing pottery. I still bake when I can, and have the beginnings of ideas about turning my baking into a life longer term. But I think why I wanted to start this back up was simple, a place to stick some thoughts. I'll talk about getting back into pens, I'll probably not review per se, still. I'll post about baking off and on, and my slow exploration o fwhat a business plan looks like for a small bakery operation a few years out. And I'll add in some other stuff along the way. Painting, and ceramics, and my life in general. So there you go. Thanks for keeping me in your rss reader if you're seeing this. I'll probably get rid of my inkandflour instagram and twitter and just move everything to my personal ones, but that's not an immediate concern. Mostly I think I am looking for an outlet. A place to stick some thoughts about what I do, and what I like. I missed the weekly rhythm of talking through what I was reading/watching/listening to, and while those posts may have fewer links for a bit since I've backed away from pen blogs a bit, I think they may start coming back. If I'm being honest though, it's an excuse to get some words out about pens and bread and pottery and how I spend my time. We'll see what it becomes together I guess. Well hey there! Ink and Flour has been quiet. It's been a crazy summer. Travel, more work chaos, some personal life chaos, and a change in housing arrangements. But coming to the end of August things are settling down in some ways and ramping way way up in others. My pens and ink and notebooks are all being used, but mostly to help me figure out taking my obsessive baking to a level where I can regularly sell stuff! It's exciting! And scary! And means my weekends are pretty much all taken up with ingredient prep, tools prep, and then a lot of dough. That means Ink & Flour may stay quiet for a bit longer. But rest assured, the pens are getting used. 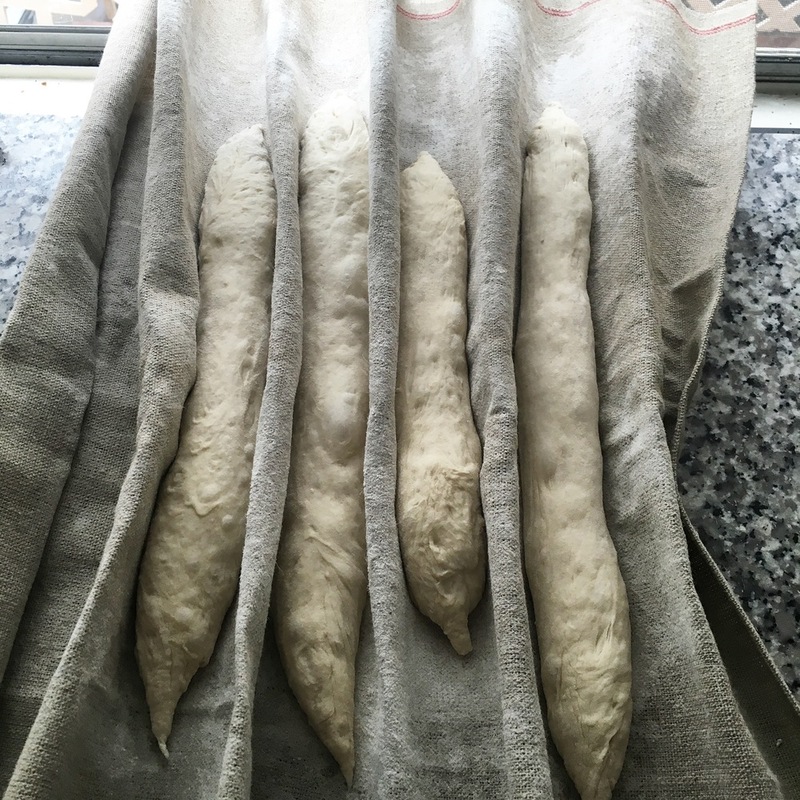 In the meantime I have a blog over at bread-work.com that you are welcome to follow if you want occasional updates from a guy trying to slowly launch a home bakery. While I have it in mind that I don’t want to post too many promo blog posts, I have to say, these notebooks seem like a KILLER deal. I’m going to split an order with a coworker soon because I’m very curious what the thicker Tomoe is like. Always like reading about favorites. I really like that R&K, too bad it was an LE. I did notice Anderson Pens seems to at least have samples available still, so maybe I’ll grab a couple of those. Just found Joanna’s blog last week after she posted a comment here and it’s great! This is a really thorough review of a nice looking notebook. The 100 pg version especially seems like a good deal. That third pick was a twist! I don’t know much about Delta, and the one Delta I have is part of my to-sell pile (I should really post that list of pens for sale, shouldn’t I?). I definitely hadn’t written the brand off, but it wasn’t very high on my list of brands to acquire more of, perhaps it deserves a closer look. Come for the rundown, stay for that beautiful Montblanc Brad bought! The beer and cheese bread I mentioned last week was a rousing success, some pictures during the bake, and I finally remembered to take a crumb shot of some bread! Also, pictured even though I didn’t mention it last week, that jar of reddish orange liquid was a first batch of naturally fermented orange soda. Unfortunately one of the glass bottles exploded in my hand. It was a very messy, and if I'm being honest a bloody, affair. Even though I did get cut and my glasses did get broken, I’m mostly whole still, and planning to make some more soon with different bottles. 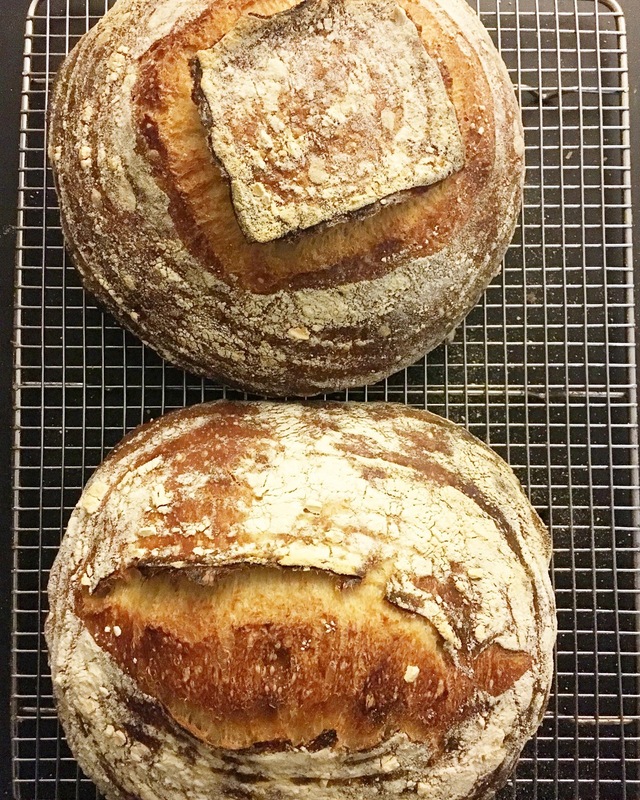 Otherwise just a couple loaves with commercial yeast this weekend for the Marin Headlands trip. Both starters are in the fridge, will take out the dark rye one later this week to bake for a dinner on Saturday. The next month or so I’m going to play around with baking during the week, trying a few different schedules. And after that I’m going to embark on some scaling bakes, i.e. I’m going to work on baking 6 or so loaves in one go. Finished Perdido Street Station and that’s about it. I’ve been catching up on New Yorkers again, and kind of casting about for the next novel to tackle. This week saw me posting a bit about my new pen and new ink arrivals here, first in what will be an occasional series when I get new stationery stuff in. More things arrived this week, some Rohrer & Klingner inks and the Pen Addict Episode 200 Notebooks. I also made a surprise purchase because Thursday morning I was poking around Amazon and found a Sailor Pro Gear Imperial Black from a Japanese seller for about 40% of the normal price. I did a little bit of digging and found reason to believe the seller was legit. I couldn’t believe how cheap it was! It’s still not a cheap pen in the grand scheme of things, but I’ve longed for this pen for a good long while but never felt like I wanted to spend the full price for it. It will take awhile to get to me (mid to late May was the estimate) but I couldn’t pass up the deal. And with that purchase I’m now officially back on a pen spending freeze. August is a ways away, but I want to save up for the SF Pen Show. Planning to work on my wishlist/to-do list for the show in the next few weeks, will probably turn it into a blog post. Otherwise, busy at work, busy baking, and put in a good amount of work towards moving my baking from hobby to small side business. My draft of a site is below! It’ll be a slow/small start, but think I’ll be ready to launch in a few weeks for locals. Am even going to offer some shipping options in a limited capacity I think. Exciting times! For now though, onto the links. Ray does a great job with FPQ. I think his links are interesting each week, his reviews are great, but my favorite part of his blog is how focused on usage it is. This week Ray cleared out a TON of pens, and reading his thoughts on each pairing and getting a sense of his changing opinions on various inks and pens over the course of time is great fun. I won’t link to all of them, but here’s a couple of posts on pen and ink combos from the week that I particularly liked. I lost an eBay auction for this exact pen a few weeks ago. I’m still keeping an eye out for a 360 from Omas in a few colors. I’m imagining they’ll just get harder to acquire as time goes on. This pen is still very high on my list of wants. Just beautiful. I also really love the look of this R&K Blue-Black. I had forgotten how much I like the look of these Sheaffer Balance II. I have started ebay/peyton st pen browsing again. Pelikan M120 - Pen! Paper! Pencil! I’ve always liked the look of these classic Pelikans, not sure if I’d want to get the remake personally, would probably rather a vintage. Oh wow. Wow. Wow. I don’t usually go for the ‘things painted on pens’ look since my tastes lean towards the plain/minimal. That said, this pen is BEAUTIFUL, and Susan’s story about acquiring it is a cool inclusion. I think sometimes in the blog world purchases aren’t talked about in practical terms, e.g. what did I have to get rid of/how much did I have to save to get this pen. That Omas going is a shame for sure, but I think it’s more than worth it given just how detailed and incredible the art on this pen is. Absolutely beautiful again! That Tibaldi is gorgeous and I love the way the ink window is on the end. Walnut and fig bread didn’t last too long from the weekend. I need to tweak the ratio of walnuts to figs I think, but a whole loaf disappeared in about 30 minutes at work and the other loaf was gone by Wed.
And speaking of Wed. that morning was when I baked off the first two loaves with the new starter. I am VERY pleased with how the bread turned out. Took pictures of the finished loaves but no crumb shots. It’s always interesting using a new starter. The dough behaves differently and each starter I’ve used has had its own personality for lack of a better term. I’ve taken to calling the all AP Flour starter that is solely based on the King Arthur Flour kit ‘Arthur’. Arthur is very active, with clear bubbles and lift even 20 minutes after feeding. I was both working with Arthur and also trying a week night sourdough schedule. I mixed it after work, around 5:00. Autolyze for about an hour, then added salt and levain. I left it out for 2 hours, folding four times, then into the fridge. I took it out in the morning to give it one more fold for good measure/check on it. Then after work, again about 5, on Tuesday, I took it out, shaped, and let them proof for about 3 hours. Out by 9:30 pm. 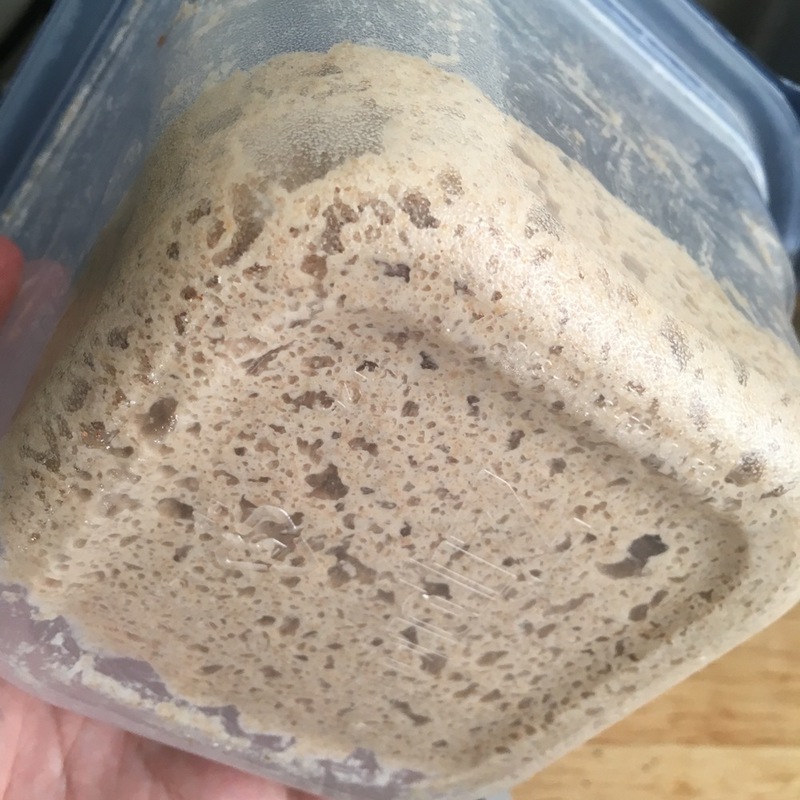 I want to tweak the schedule, and play around with shorter bulk fermentation but much longer proofing possibly, but it proved the idea of sourdough during the week. Yesterday I baked two loaves of sesame sourdough. One loaf for the housemate and her boyfriend to take on a road trip, the other for eating. Today is cheddar beer sourdough, an experiment in adding beer in for about 45% of the water. I got a later start than I originally planned today. It’s been warm the last few days so Arthur was moving too quickly. 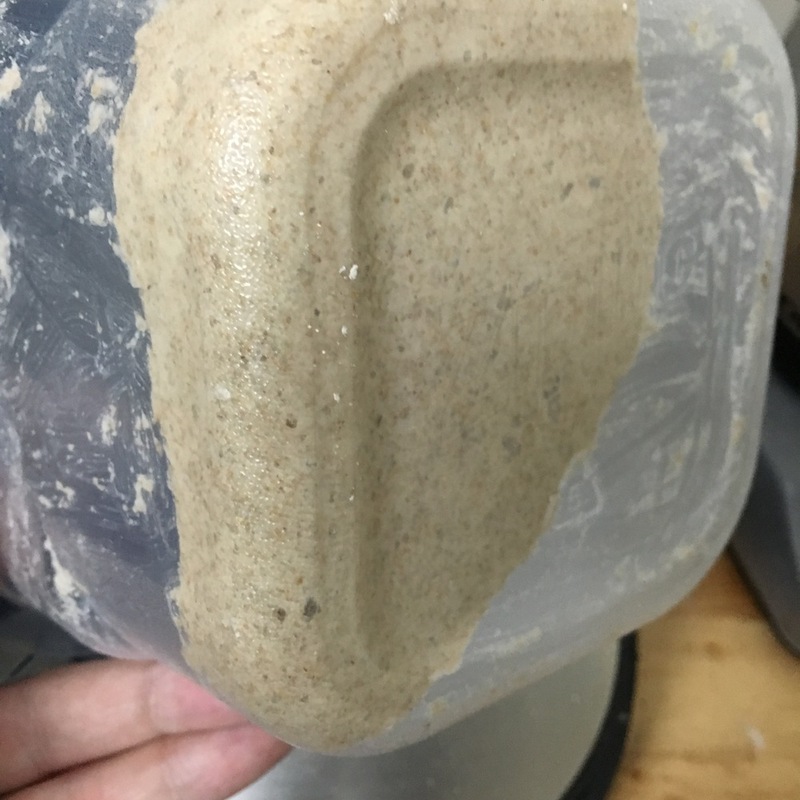 I mixed the levain at 7:30 pm last night and by 6:45 when I got up this morning it had risen and fallen completely. Fed it a bit more and gave it about 3 hours to perk back up. Folding in the cheese in about ten minutes, will probably have the bread out before I go to sleep tonight. I’ve been very stressed! So I’m going back to a warm blanket of a novel, Perdido Street Station. This book is incredibly weird and uncomfortable. I recommended it to a friend and had forgotten just how gross and weird it is, but I love it so much. Probably my 5th time through. Will probably spend part of this evening reading another warm blanket book, Bluets by Maggie Nelson. Her odd and affecting book of verse/prose poems centered on the color blue and loss and love and how we deal with grief. Quick post with some thoughts on newer arrivals. I haven’t done one of these in the past because there just hasn’t been much to talk about since getting to a more regular schedule. I’ve bought almost no ink or paper this year and no pens until the Edison below. I’ll probably keep the spending reined in a bit, but three bottles of ink and a pen within a week was a nice prompt to jot down some first impressions. I mentioned the inks in the roundup post last week, but I’ve now played with them a bit more. The three inks are Australia, Dublin and Atlantic, a dusty purple, a dusty blue and a nice subdued green respectively. I hadn’t really heard of Super5 until pretty recently. There was a Super5 pen at Goulet Pens that I reviewed awhile ago and liked, especially for the price. These inks are madeby Rohrer & Klingner, which is great news as the R&K inks are solid. Super5 inks are pigmented and waterproof on top of the normal R&K performance. All three colors are muted, so if you’re looking for super bright greens or blues, these aren’t for you, but they are pretty perfect for me. I put the Atlantic in my new Edison the other day and so far it’s behaving well. At first it gave me some problems but I think it was a condensation in the converter/feed issue, because since that first hiccup it’s been solid. Good flow, not too dry, and I really love the color. I tested the waterproofness too and it seems to be bulletproof in that regard. Looking forward to filling some other pens with the other two colors soon. I have looked at this pen at least once a month for a year and a half. When you look forward to something for so long it inevitably gets built up into something greater than the object itself. But I still wanted it. December of last year I decided to rein in my stationary spending pretty intensely. I’ve talked about it before so I won’t go through it again, but when I made that decision I also decided that this pen would be my reward. I had months to save up for it, and had wanted it for so long. When it came time to send the email I was shocked by how nervous I was. I knew I could afford it, I knew I had looked at it forever, but I was still worried it wouldn’t live up to my idea. I shouldn’t have worried. I love this pen. I’ve used it a bit in the last week, not as much as I’d like to, but it is a beautiful beautiful thing. The gold furniture and the acrylic are perfect together, and I’ve always thought the Morgan’s shape was elegant. It’s a perfectly balanced pen for my hand when it’s not posted. The nib is as good as you’d expect. A touch of feedback, medium flow, overall smooth and consistent. I fully expect this pen to stay inked for awhile. Why do we buy the pens we buy? Most of the time when I am in the process of buying a pen I weigh a few things. Budget (can I afford this, can I not afford this but lack willpower, etc), aesthetics (do I like how this looks? do I want to see this on my desk, etc), rough priority compared to other pens I want (yeah this is on sale, but it’s way lower on the list than the pen I’m two weeks away from saving for), and finally, do I think I’ll use this enough to justify the purchase. That last one is the one I’ve been thinking about a lot over the past few weeks slowly writing this review. In the beginning, there was a pretty strict correlation for me between “use this enough to justify” and “will I write with this a lot.” As I’ve started figuring out what I like and don’t, why I want certain pens and don’t like others, and what role pens can and do play in my life, my view has become a little more complicated. Justifying a purpose is about understanding why I want a particular pen, and realizing the appeal/justification can take a number of forms. For a long time I justified primarily by trying to gauge time I’d spend with a pen and seeing if I thought the price was ‘worth’ that time. But obviously we all want pens for a number of reasons. Collecting, aesthetics, use, etc. Maybe I want that Retro 51 Tornado because I love cats, and I want the TWSBI Eco because I am interested in understanding how a company can make a piston filler for that little money. I think most of us want a Nakaya primarily because they’re so jaw-droppingly beautiful. etc. etc. So I’ve moved away from this strict correlation between amount of use and amount of money, and it’s freed me to buy things that are really fun, but that will never be everyday writers for me. Enter this beautiful guy. Officially, the Italix Parson’s Essential in Black with Left Oblique Italic Nib. I’d seen people post about these pens, and specifically the oblique italic nibs. Now, my handwriting is terrible, pretty much full stop. I write small letters that are mostly messes and I’ve lost the patience for practice on this front. This means I tend to write with small nibs that allow me to scribble quickly and not blur my letter forms too much. That means early on I had a hard time convincing myself to purchase anything larger than a fine because I was afraid I “wouldn’t use it enough.” These days I’m more willing to experiment because I’ve realized I really like what larger and unique nib grinds can do for my writing. When I’m writing slowly, a stub nib can make my handwriting more readable, and even if its just in my journal, or random note taking that may end up in the trash, I enjoy the result even if the time and care needed can’t translate to, say, a note-taking at work pen. So when this popped up on Massdrop with all the nib options I decided to give it a go, and settled on the medium left oblique italic nib in the black body. It’s an understated pen overall, black with gold furniture. Very classic, and honestly not normally in my wheelhouse. I don’t love gold for furniture, but something about the cap band really spoke to me and I liked it in pictures better than the other options. I chose the nib based on the writing samples and a bit of reading. I knew going in this nib would require a bit of dialing in but I really have liked seeing the writing from this nib on this pen. I got it via Massdrop, which, per usual, gave me a nice little discount. Enough to push me over the edge on something I already wanted, but that’s about it. I have to say, this pen has really impressed me in person. While it’s simple, the cap band is a nice subtle pop of color that pushes this beyond your normal black fountain pen. It also has heft which I like a lot in my pens, feeling sturdy with a satisfying weight capped or uncapped. When you uncap it you’ll see a generous section. While I’ve never really been bothered by shorter sections unless they were extreme (pocket pens and the like) it’s always nice to feel like there’s no reason to worry about digging in your fingers. The cap screws on solidly and the threads are really smooth, and feel incredibly fast. I think it takes a turn and a half or two to get off/on but it’s so smooth! They’ve done a great job manufacturing these. It feels great in the hand, too. I tried posting it a couple of times, and while it felt safe/secure it made the pen a bit too back-heavy. The cap is HEAVY, almost as heavy as the barrel I think, so adding it to the back made it too much. That said, I’m a guy who doesn’t post his pens in general, so it’s pretty rare that I feel a posted cap makes the balance better. Unposted it felt great. I wrote a few different thank yous and then used it in my Hobinichi off and on for the next month before flushing it out. I never felt cramping at all, and in fact really looked forward to writing with this pen. Now, the nib. I really like it. It’s not an everyday nib for me, but it’s smooth, with medium to heavy flow in general. It has some sweet spots for sure, but that’s just italics in general. The oblique part gave me the most trouble honestly. It requires a pretty specific posture/hand position. I never found this uncomfortable, just unusual. Once I figured out the angle it took, and this isn’t an exaggeration, maybe a few lines at most to get the muscle memory down. I think it was easy to get myself used to it in large part because of just how smooth and great this nib is to write with. The first thing I put in the pen was J. Herbin’s Emerald of Chivor, and man did it make this nib sing. I had planned to use that ink for some thank you letters and the left oblique italic nib worked flawlessly. I got enough line variation to make the writing interesting, and enough of a line width to see the beautiful sheen and crazy gold sparkles. It was fun to write notes to folks with that extra little sparkle and the extra interest from the italic nib. Overall I am very pleased with the Parson. It will stick around, and I may even get a spare nib unit in something a bit more everyday-y to have a reason to pull it out more. As is though, it’s become a favorite. In fact, as I’m typing this I reached over to pull it out of the case. I had flushed it and put it back in storage a couple weeks ago but think I’m going back on that. For a pen I really didn’t expect to want to use regularly, I’ve been impressed and expect to keep finding reasons to keep it inked regularly. Since it’s getting near the end of the month I figured I’d update what I'm using from the January post. Given that I’m not buying a ton of stuff these days and am trying to focus explicitly on using what I have and giving myself time to really get to know a pen or an ink before moving on to the next shiny thing, it hasn’t been a HUGE shift. But I started off with a few rules (wanting to keep my number of inked pens down below 5, focusing mostly on three as daily users, notebooks should have a purpose, and they should be used until full, finally no new pen purchases until April 1st at the earliest), so let’s see how I’ve done. This has mostly kept to the plan. Field Notes or similar for daily work/life notes and a separate small notebook for writing snippets, quotes and such, etc. I’ve started keeping my work/life book in my Nock Co. Sinclair, which means the leather cover and the attendant “quotes” notebook is getting less use. Otherwise, still using the Hobinichi, averaging three or so days a week, which I’m fine with compared to my “use it for two weeks and not look at it again until May” strategy of last year. Life Notebook is really really great and has been my companion throughout The Focus Course. The only real change has been an addition. In my Lilliput review I used the Writing Pad from a local bookstore as a background item. (the Book/Shop pad above) The paper has a ton of tooth, so it’s not great with some nibs, but I really love how beefy the paper is. This has become my go-to for just ‘writing’. Usually when trying a new ink or when I have the urge to write but don’t have any sort of purpose. I’ll write out poems I like, write about some passing frustration or just doodle and scribble all over. It’s a satisfying object and feels great to write on especially with any of my bigger, wetter nibs. I’ve kept myself to a small number, writing some things close to dry and other things getting flushed. And even though my numbers are pretty much the same there’s been movement. Started with the Edison Herald, the Kaweco Lilliput, Levenger L-Tech Stealth and finally the Parson Italix. The Edison was written dry and cleaned out. Replaced it almost immediately with my Parker Vacumatic inked up with Akkerman 7. I love my Vacumatic but it’s not been restored as well as it could have been I think, so it stays at home. The Lilliput received a BB nib midway through this time span and I had a lot of fun with that crazy huge nib. But for everyday use I wanted the EF nib back. I decided to build off the unexpected love for a pocket pen and see if I’d get along with them better. So I switched the cartridge over to my aluminum Kaweco Sport in the denim blue. I have a clip on it so it’s a great fit for both a pocket or my beloved Sinclair. Inked with the same Noodler’s Black Swan in English Roses. I’m nearly out of my sample vial, and I like this ink enough that I may end up getting a full bottle. The Levenger is a really nice looking pen that I just don’t seem to like very much. It’s got a good weight, but the nib could use a bit of love from a nibmeister. And overall I want to like it but after writing through about half the converter it got cleaned up and set in the pile to be sold. I’ve given it four or five attempts to win me over, and when I see it on the to sell pile it still catches my eye, but somehow that doesn’t translate to use. It’s a mix of a bunch of things, the nib issues, the section isn’t the most comfortable, and while I do love a heavy pen, this one feels both heavy and maybe just a tad too traditionally masculine/tactical. So the Levenger was replaced with the Namisu Nova when it arrived. I love this pen quite a bit. It’s beautiful to look at, and while I did have SOME issues with the titanium nib, I flushed it and set it aside once my replacement steel EF nib came in. It’s got Noodler’s Black in it because I inked it while at work and that’s the only bottle I keep at work. I have been itching to ink up another pen, something a little bigger or heavier, but we’ll see. I’m very pleased with using a smaller number of pens, I feel like I’m getting to know them better and getting to know the inks better as well. Still using the Ti2 Techliner and have been using the Bohemia Works Blacksun 1770 HB pencil. I got it from the CW Pencils POTM Club when that existed. It’s a great looking pencil and the graphite is dark but retains a point pretty well. Still using and loving my Nock Co. Sinclair. It’s the primary home for pens and pocket notebooks. As mentioned above the leather case isn’t getting a lot of love anymore. The big change here is that I upgraded my bag. 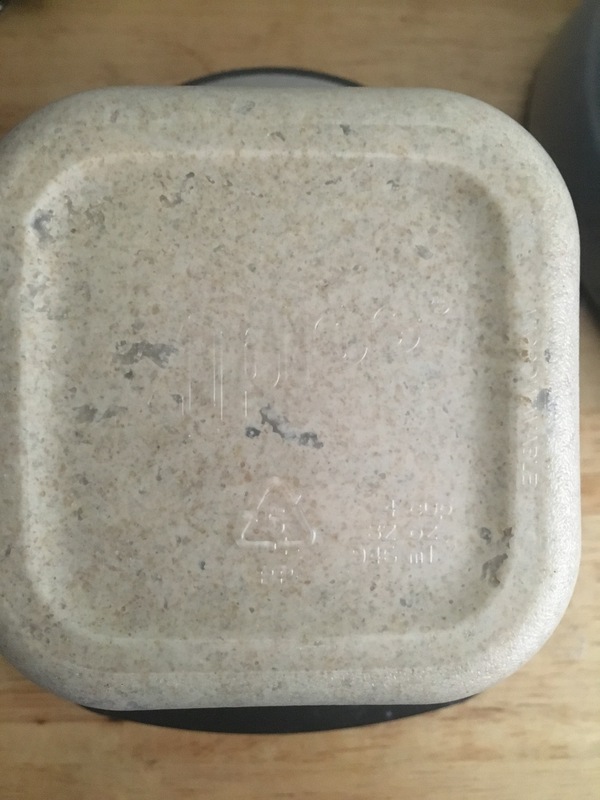 I really liked the briefcase in my last post, but it was showing signs of wear and I had a hard time blaming it. I wasn’t overloading the bag necessarily but I think I did push its limits a bit. One day after work I noticed someone from my building with a really nice looking briefcase style messenger bag. It took me a couple of weeks of following him and frantic googling but I determined it was a Herschel Supply Co. bag and probably the Clark. Happy I had solved the mystery I tried to buy one and discovered it was out of stock, and appeared to be discontinued. So off to eBay I went. I’ll spare you the long saga and just say I ended up with a “like-new” one in Navy and this is hands down the best bag I’ve ever owned. It’s a briefcase style bag, with a shoulder strap that has a nice comfortable pad. The leather enclosure has a very satisfying magnet to keep the two short handles together. A huge pocket on the outside that closes, and an open slim pocket on the back. Inside a very cushioned laptop sleeve and an array of pockets with mesh and zippers. It fits everything I want for most days at work or on the weekend and feels sturdy and comfortable. I love this bag and am already stressed out about what I’ll do whenever it falls apart. I figured I’d touch on this too, more for posterity. While I received a new pen in the last few months, it was purchased last year via the Namisu Nova kickstarter. Otherwise I’ve not bought any pens save for a pilot penmanship that was a gift to a friend (for the EF Pilot nib). I’ve gone in on two ink massdrops though, getting three bottles of Rohrer and Klingner as well as a couple of Super5 inks. Inks have been the smaller part of stationery purchases and the R&K stuff especially are long overdue since I know I love their inks and have been hoarding a couple of ink samples. Otherwise I’ve only bought the new Field Notes Colors Edition. Sweet Tooth looked fun and I had wanted to get the new Tournament of Books FN because I like the little Rooster guy. I’m pleased with my reduction in stationery purchases and it’s been great to focus on what I have. That said, I am kind of idly gearing up for some pen purchases post April 1st. I know I am going to get myself my reward pen from Edison, and then will probably focus my energy on saving up some money for the SF Pen Show in August. I am hoping to have this year be mostly a trial sort of pen show. Get some nib work done finally and then try to write with a few Nakaya’s and figure out which of the larger Pelikans I think would fit my hand the best. I’ll take a look at some vintage stuff again I’m sure (another Vacumatic is calling to me, ideally a shadow wave one) and will probably be unable to resist a Franklin Christoph Model 20 finally. Two weeks worth of links again. Between travel and work the last couple of weeks flew by. The picture below (while giving a glimpse of my recent Field Notes) shows the primary reason for missing a week. 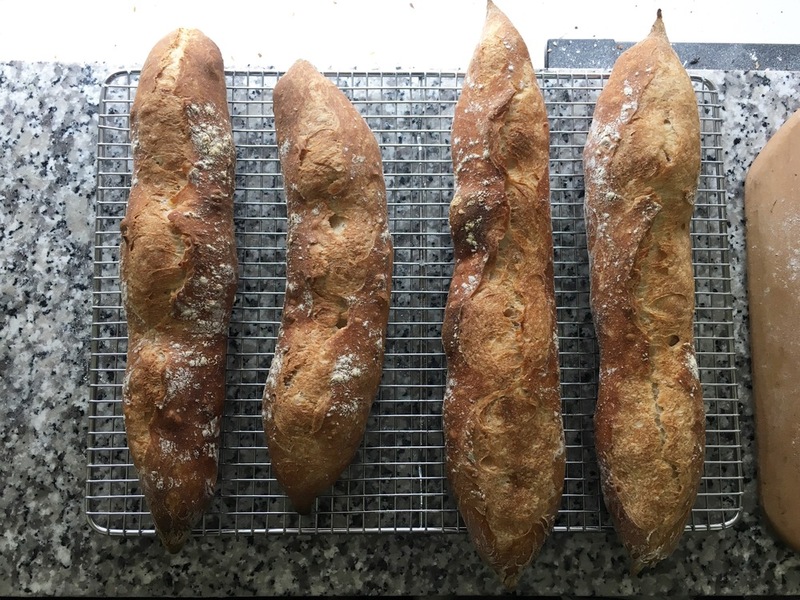 I’m working on a curriculum for bread classes, trying to gather material from all the places I’ve learned from and add my own twist. It’s been fun, and at times a little hard, but it’s definitely where the majority of my writing energy has gone for a bit now. I am really loving Ulysses for my writing. It makes it really easy to sketch out the overall structure and I love being able to use Markdown and then exporting with a favorite style and voila a pdf ready to hand out. But there’s a ton of links below, an actual ton! When I haven’t been working or going through a spring purge of belongings, or traveling I have been playing this completely insane video game. It consumes me. Love these little guys! I’m happy Curnow is local, so I can always pick up more at the SF Pen Show. Really recommend all their stuff. The a5-ish size tomoe river paper notebooks are a favorite. An older post, but it helped compile a lot of things I’ve read here and there in one post. I spent a nice bit of time one day over the last fee weeks catching up on The Pen Haul. It’s a great site if you haven’t visited yet. Love the photos in this one. They really are beautiful things, too bad about those barcodes! I am continually impressed by Pete’s dedication to these experiments. I love coffee and have roasted my own a few times but quickly decided this was a hobby I’d leave to the professionals. That said, I do own like 6 brewing methods (just ordered a new pour-over method actually, the Manual Coffeemaker, because there was a flash sale and I got it for 30% off). After a solid month and a half of not drinking coffee I’ve enjoyed coming back to it and being slightly more precise about it all, taking notes on grinds/temps/times and generally dialing in my home coffee set up. Ray’s Long Island Pen Show wrap up post, the parts bag looks like a lot of fun and a reminder that I have four or five lever filler pens in various stages of disrepair all received from friends/parents of friends. Maybe I’ll pull those out over the next few weeks and take a stab at some repair. Another good post about the importance of getting started. Like Brad, and I’m sure the majority of us in the pen world, aside from vintage ones, Parker fountain pens haven’t been high on my list. This review is glowing, and while I’m not sure I love the red and black finish personally, some of the black/white ones I’ve seen are very tempting. This is really cool! I always like the little non-stationery glimpses into pen bloggers’ lives. I really continue to love this pen. It’s unfortunately now making me want all of the other pens that have similar style lines (e.g. Edison Pearl and Nakayas). I will echo that the titanium nib has been a bit hit or miss with me. I switched to the steel for everyday use. My favorite podcasting app, Overcast, just released a new version and it’s great. I unexpectedly adore the dark theme. Really great story that I’m sure mirrors a bunch of our experiences. My second go-round of fountain pen obsession was really bolstered by the Goulet folks’ videos as well. I learned a lot and still revisit them to remind myself of basics/terminology/etc. Correspondence has always been a weakness of mine. I am at the point of journaling regularly, using my pens near daily to write about what happened, plan out bread baking, etc. etc. I keep a notebook on my nearly always and have found that to be invaluable. I’ve always wanted to be a good correspondent but always end up finding excuses. Part of it is what Fr. Kyle references early on, the fear of not knowing what to talk about, but I think I’m ready to just write through it, and love the idea of reading historical letters as inspiration. I am pretty sure I learned about this from Kottke for the first time a few years ago. I really love the look of these objects, they remind me of Nakaya’s. Really only a couple of loaves this past week. Parmesan black pepper sourdough again which has quickly become my favorite bread, and this weekend I’ll probably throw something together to eat in the early part of the week, but most of my bread energy and attention has been focused on class prep. Started The Metaphysical Club, a great book (so far I guess) on the history of American thought between the Civil War and World War 1, focused on the lines of thinking leading to Dewey and pragmatism in America. Was recommended years and years ago but just finally starting it. Other than that I’ve been on a New Yorker binge, trying to get caught up since the new year. I think my unlikely favorite article has been this one, on a cheating scandal happening in competitive bridge. I’m writing this from my family’s place in Austin, TX. It was a rush of a week at work trying to wrap things up for handoff while I’m away for a week. In the midst of all of this I had a fun night drinking a bunch of fancy ciders at a local bottle shop, Alchemy. They sell a lot of stuff online and in person are a really great resource. I learned a bunch and drank a lot of things I didn’t even know existed. Other than that excitement it was a quiet week. No baking at all since I was either busy or knew I’d be out of town, and not much time for reading. But there were a LOT of links this week that I loved, so a link heavy edition for sure. This is a great post with great resources, it’s also another in a long line of posts and conversations about how to use your fountain pens. I always feel like I want to write a post for those of us who don’t have an easy way to use fountain pens all the time normally that essential boils down to, that’s okay too! I try to fit them in where I can, but I’ve also gotten comfortable with the idea that this is just leisure for me. I write nonsense, journal, draft stuff for work sometimes, but I’ll never be a person who can take advantage of huge capacity pens. I even regularly half-fill pens! I think we’d all like to write more though, and this has a bunch of great ideas in it. I’ve got to be honest. I’ve never thought this pen was particularly attractive. The fact that it’s apparently not a great writing experience means it's even further off the list. Even so, it’s always interesting to read takes on pens that take the world by storm. Epic and totally great write up of a small pen show. All these write ups are making me antsy for August! I started very very briefly to get into bookbinding so this post was fascinating. Really gorgeous looking books. Well Appointed Desk Link Explosion! I’ve been sorting through a bunch of things and found all my old watercolors. I think I might take a stab at some sketching and painting again in the coming months. This looks like a really interesting set. Interesting new entry level pen from Pelican. I don’t love the styling, but it seems like a worthy addition to lower end pens. A THIRD Ana post! I want this ink immediately. Beautiful and exhaustive run down of a notebook setup. Mine is less complicated, but I really love the attention to detail and just in general enjoy knowing what folks are using/how they’re using them. Nothing! 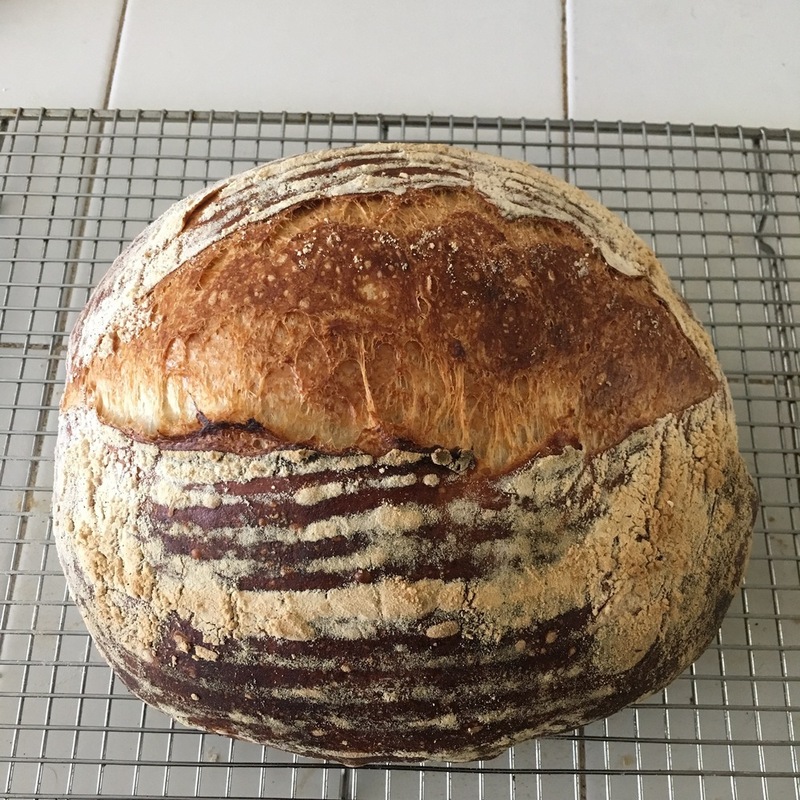 I baked a loaf with einkorn wheat last weekend, an experiment with a new flour. It turned out well but I was underwhelmed by its effect in the bread. Used it for tartines a bunch but this week was definitely all about prepping for getting outof town. I mentioned this last week, but I finished The Pulp Vs The Throne by Carrie Lorig and you should buy it if you at all enjoy poetry. Phenomenal. Otherwise, not much to report. I did watch part of the Oscars, and wish I had not spent my time doing that! My sickness last week lasted into this week, so home from work a few days and then a couple of lighter days in the office. Just a head cold, but it hit me really hard. I had planned to bake during the week but decided to prioritize early to bed and lots of tea. I also didn’t even remember until the 4th that I had planned for InCoWriMo because my schedule was all off. I’m planning to start up on Monday sending off letters and cards to folks. I had already planned to do a slightly lessened schedule, something like 3 or 4 things a week instead of 1 a day, so it’s not the end of the world, but I was bummed when I realized the cold had thrown me off that much. A lot of links again this week! Not much baking, and not much consuming. But most exciting, new content here on the blog! I reviewed the Kaweco Lilliput Brass Wave and enthused all over that thing. I really love that little pen and tried to explain why. It was a fun thing to write, and took me awhile because I was at first trying to review it in a more straightforward way. Here's the pen, here are the specs, is it worth it y/n. I realized last week that what I actually wanted to write was a piece on why I love that pen even though I don’t tend to get along with pocket pens at all. I’m happy with what I came up with, and I think the process of writing through why I in particular liked the pen is a nice model for how I want to keep writing about stationery. Not reviews as shopping guides, mostly because I think so many other people do that so well already and I don’t think I’d be great at it, but reviews more as explanations for why a specific thing works or doesn’t work for me. Maybe it’s a subtle distinction without much difference? But it feels good to me as a way to think about the blog, and it’s very much in line with how I used to write about music (did you know I used to write about music? I used to, it (mostly) all lives here). Anyway, enough navel-gazing! Onto the links! I love love love this post. Of late I’ve started to really appreciate how strongly held his opinions are. You may disagree with him, but he’s a good writer, and a great photographer, and sometimes it’s just nice to read someone with a strong point of view. His dismissal of analog watches early on in the Apple Watch conversations online seemed perfectly made to follow up with a post like this, and sure enough he’s been lured over to the mechanical watch side. I have a 40 dollar Seiko 5 Military Watch that I adore. I got it last year and it was the first watch I’d tried wearing in years and years, now I feel naked without it on my wrist if I’m leaving the house. Definitely ordering one of these in the not too distant future. What a FANTASTIC post! I think he’s filled a nice niche. It’s a great overview of other posts, resources for information and education, and a perfect link to send to anyone who expresses an interest in our weird hobby. Really well done, definitely check this out. This pen is beautiful! Way out of a price range i’d feel comfortable spending this year, but that green especially is so striking, so beautiful. I like this pen a lot more than Ed, but I got a good deal on mine, and didn’t have too much trouble with the grip section. I think the nib is fantastic, way better than I expected, and I love that I can swap it out to a Safari if I want to. What I liked most about this review was how well he handled a pen that he felt was fine, but just not worth it in the end. I think it’s hard to do a negative review that still leaves room for the reader to figure out if a pen would work for THEM, and Ed did that here. CW Pencils with a really cool post on their visit to Caran d’Ache. Federico Viticci goes deep on what is now my iOS email app. When Mailbox went away I was annoyed, and bounced between a few different apps (Spark and Outlook were the two primary contenders). I liked the look of Outlook a lot, but missed some of the swipe functionality and liked the functionality of Spark but kind of hated the user interface. Airmail is great on my Mac, and even better on my phone. Happy to have this issue solved again. Like I said above, not a lot this week or even weekend. The loaves I posted last week turned out really well. Great open crumb, a nice tang but not overwhelmingly sour. I ate through one of the loaves in a few days and sliced the second one up to freeze. 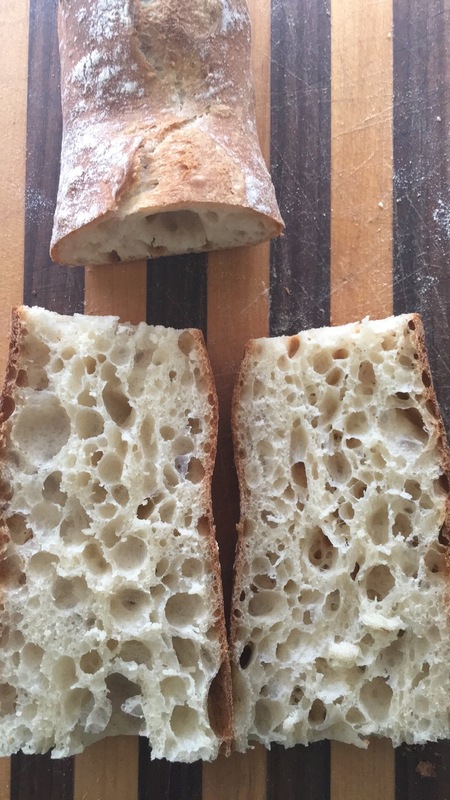 Sourdough freezes really well! I wrap two slices in aluminum foil and then it takes about ten minutes in a 400 degree oven to have two fresh feeling slices of bread. This is the batch I’m making this weekend, a new formula to try. Sourdough with parmesan cheese and cracked black pepper. I had the idea on Friday and looked around for some formulas to try and then built up Slime Season from the fridge. Will report back next week, and hopefully have a bit more bread to talk about. Baking has been lower on the list of priorities the last few weeks and I’m itching to get more bread out. Another lighter week for consuming media. Started a very odd collection of Felix Guattari’s writings on Japan called Machinic Eros. It’s great and I’ll probably finish it later today. I think the plan for this next week is to do an audit of books that are in progress around my place and then turn my attention to finishing some of those up. Otherwise, you should all watch the new Beyonce video because it is fantastic. My housemate likes to give me a hard time over how much I love small versions of things. I've purchased produce I don't think I'll like just because of it's size, pins and miniature models of stuff just because it's small. Hell, I have a small collection of sake cups, and I have had sake maybe five times IN MY LIFE. It makes sense that I’d like pocket pens, then, right? They're fountain pens, but small! Except after buying four or five pocket-sized fountain pens I finally admitted that even if the pocket pens were smaller and more portable, I just didn’t enjoy using them. 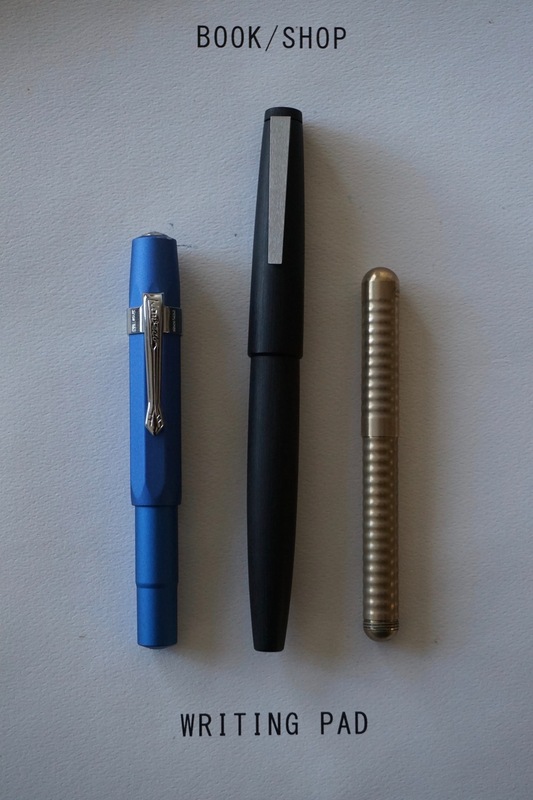 I’ve reviewed a pocket pen before, and even gave it a glowing review. I admittedly rushed into the review, but I just loved how it wrote, and the form and was so excited to talk about it. Now it’s been over a year and after my initial love I realized I just didn’t want to write with the Passaporto. I always missed the feel of a full pen, and almost all pocket pens are uncomfortable if you don’t post them. Given that my normal habit isn’t to post pens, I routinely would forget and try to start writing unposted, leading to cramping. Which isn’t really the fault of pocket pens! It's just a mismatch of how I use my pens and how pocket pens demand to be used. All of that goes to why I've held off on this pen for over a year. I saw it here and there, and Brad's review (and Mikes review and other Mike's review) almost tipped me over to ordering it, but I kept waiting, and waffling, and convincing myself that it makes no sense to drop ~90 dollars on a pen I probably wouldn't like. Yet my desire just wouldn't go away. Something about the brass, and the wave pattern’s vintage feel kept it on my radar. So when it popped up on Massdrop, I went ahead and bit the bullet. I got a good, not great, deal on this pen, which is pretty normal for Massdrop. A month or two later my package arrived, a Kaweco Liliput Brass Wave with a steel EF nib. Hoo boy have I been taken with this thing. I’ve had it for over a month now and from the moment it arrived until today as I wrap up this draft this pen has been inked and on my desk or on my person. I flat out love this pen. It’s definitely small, even smaller than i had anticipated, honestly. Under 4” capped, and only a whopping 5” when posted. But it’s got *heft*. The brass means that even if it’s short, it weighs almost 25 grams when inked. That weight makes it feel solid in my hand, nixing the complaint above about missing a fuller pen. For comparison, the weight of a Lamy Safari unlinked is usually listed around 17 grams on most websites. And when posted, the length starts to feel more normal as well. I’ve definitely written with it not posted, but not for longer than a sentence or two, and it’s hard to recommend that as a normal practice. Even my habit of not posting seems to not be a problem with the Lilliput, I think because it’s so small my normal habit of setting the cap aside is short-circuited. And posting this thing feels great. For a person who doesn’t post his pens, I’ve come to really enjoy the feeling of screwing the top onto the back. The threads feel solid, and I don’t mind the two turns it takes in part because of smoothly it all fits together. And on top of all of that, the balance feels perfect to my hand. Front-heavy in a way that feels right and again, makes it feel like a much more substantial pen. I got it with an EF steel nib, which is solid as you’d expect from Kaweco. I’m thinking of getting a cheap Sport with a broader nib to have some more options, but for now the EF is a nice fit. I do tend to like really thin lines, and Kaweco isn’t known for that, but as a general purpose writer it’s working really well. For the first few weeks I carried this with me in my Nock Co Sinclair tk, so it was with me at work, out for drinks with friends, out writing, and at home. I ran into one spate of weirdness while carrying it around, where the nib creep teetered over the edge into leakage, but it happened only once in three weeks of carrying it around. I carry my Sinclair with me everywhere at work (Coworker: Do you have a little bag for your notebook and pens, BW? Me: Why yes, yes I do, and it is cool.) and it gets swung around quite a bit so I’m chalking up that one experience to a new pen perhaps, or some violent encounter/drop I’ve forgotten. Otherwise it’s performed very well as a portable pen. Even so, the last few weeks it’s lived on my desk. I’ve missed it at work, but the combination of it and Noodler’s Black Swan in English Roses has become a favorite for my twice daily Hobinichi habit (or my attempted twice daily Hobinichi habit). I also noticed I’d written through a lot of the cartridge and didn’t want to run out while at work, so it will stay at home until I’ve refilled and then go back to the office with me. All of that praise said, I do have one complaint, which was not a surprise but is still the only downside in my eyes. There’s not a converter option for this thing. I have a few Kaweco cartridges and it came with a blue one that lived in it for about a week. I didn’t love the blue though, and as soon as I knew I was smitten I flushed the pen, cleaned out the cartridge and refilled with the Noodler’s. It’s a compromise I’m willing to accept, and it gives me an excuse to order more Kaweco cartridges to try more of their inks. But I do wish that wasn’t the only option. Even as I type that there’s a voice in my head pointing all the obvious reasons why it’s a silly complaint given the size of the thing. But hey, we all have our things to complain about. I’ve been shocked by how much I like using this little guy, and it’s easily rocketed up my list of favorite writing tools. I don’t know if there’s a lesson there about following my guts, really, but I’m glad I finally hit purchase on one of these. Not much in the way of opening remarks this week. I was hit hard by a cold end of the week and am posting this from bed. So less baking than I’d planned, less of everything aside from tea and hot toddies. But plenty of links, and a consuming mention below. This is a fantastic pen, especially for the price. As much as I love it, I’m also in the camp that it’s not the most attractive pen in the world. I think it makes up for that with price/features. That said, I’ve shown it to a few folks in my life who have reacted really positively from the get go about its looks. Brad, as always, does a nice job of summing this one up. I had completely forgotten about my high school and college obsession with old postcards, so this was a fun post to read this week. I loved old postcards for all the reasons mentioned in this post. They’re often beautiful, and have these tiny glimpses into another person’s life. In Austin, TX I used to love wandering around Uncommon Objects, picking up handfuls of old family photos and postcards. I’d stick them in letters, use them with mixtapes, etc. Maybe when I’m back in Austin in March I’ll go scrounge for some postcards! This is fascinating to me! By day I manage a team of folks who help build systems that in part rely on machine learning. In that world, this is pretty big news. Go has been an unsolved challenge, and as is mentioned in the two links above, most conservative estimates were that a machine learning approach beating a human was maybe a decade away. Up above is the more approachable article from Wired, here is the article from the Google lab directly. Again, I work in technology, and while I’m relatively lucky in a bunch of ways to work where I do, the industry as a whole has a host of really deep seated problems. Diversity being a major one. I think the shift mentioned in the article, away from what women can do, and towards what the men who dominate can do to fix the culture is long, long overdue. I really liked this post for the simple reason that it’s a unique take on the review. I love reviews like this, with a view into not just whether a pen is “good” or “bad”, but why a person uses the pen in question, what hole it fills for them, and why its features/characteristics help fill that hole. Still getting to know Slime Season, the new all dark rye starter. This is the third bake with it, and visually they are some of the better loaves I’ve made, especially the one with the simple slash. Will let them rest just a little more and then have a late breakfast before going back to bed. A lighter week this week, after my marathoning. I caught up on some articles saved to Instapaper in my downtime, and spent an evening coordinating with family to plan a trip to Austin, TX. I started a couple things, and finished a short book of poetry that I was very enamored with, The Self Unstable by Elissa Gabbert. Each page a small stanza of what could be prose. They feel like little poem riffs on a suite of ideas all centered on the self, and identity. I’m planning to go back to it in a few weeks for a second run. And with that, I'm off to fall asleep for many hours!